The leatherback turtle is dark bluish-black in colour everywhere except for its plastron (bottom shell), which is pinkish-white. The leatherbacks’ carapace (top shell), neck, head, and front flippers can be covered in bluish-white blotches. 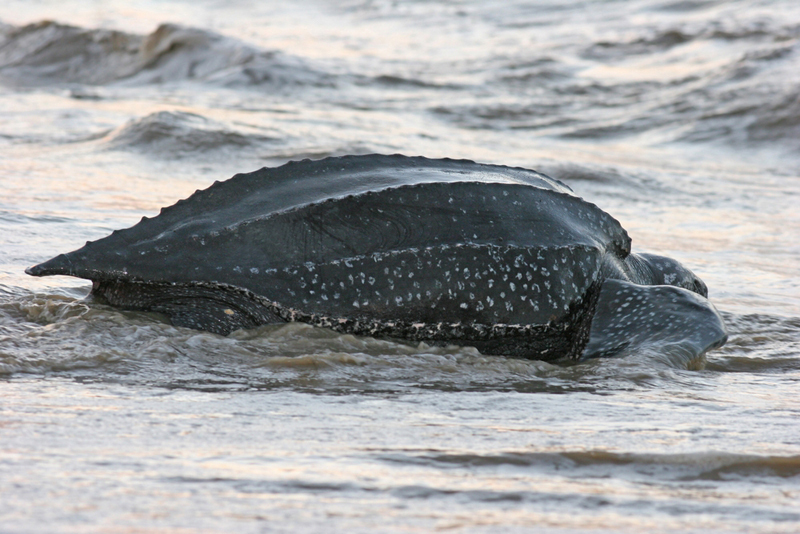 The leatherback is named for the leathery, slightly flexible skin covering its shell. Beneath the skin is a thick layer of oil-saturated fat and connective tissue, as well as a matrix of small bony plates that fit together almost like a jigsaw puzzle to form the shell. Seven ridges run the length of the carapace, which is teardrop shaped, and tapers to a blunt point above the animal’s tail. Leatherbacks have front and rear flippers. Their front flippers are long (usually half the length of the carapace) and powerful. They have no claws. And, like other sea turtles, leatherbacks cannot pull their heads or flippers under their shells. Leatherbacks are the largest of all sea turtles. When they hatch, leatherbacks weigh approximately 45 grams and their carapace ranges between 50 and 75 millimetres in length. Although mature leatherbacks can weigh more than 900 kilograms and have carapace lengths longer than two metres, the average weight of leatherbacks documented in Atlantic Canadian waters is 392 kilograms, and the average carapace length is 148 centimetres. Leatherbacks have the most extensive geographic range of any reptile. In Atlantic Canadian waters, leatherbacks usually feed on lion’s mane jellyfish (Cyanea capillata) and on moon jellyfish (Aurelia aurita).